Over the years, there have been numerous articles musing on what the office of the future would look like, but how have those past predictions matched up to reality today? Back in 1975, BusinessWeek published “an in-depth analysis of how word processing will reshape the corporate office.” In the article, industry experts were divided over whether they would be able “to call up documents” from their files on-screen and connect electronic terminals to each other or if this vision of the future was, in fact, “scare talk.” One of the biggest concerns raised was how word processing would change the traditional secretary-executive relationship. I have it on good authority from Jonathan Howell, Huddle’s CTO, that in the 1990s, everything was networked, all internal communication was done via email on a mainframe and desktop printers (with “desktop” referring to ubiquity rather than size) were commonplace. However, Jonathan was working for IBM (s ibm) in the 90s; what was it like for the rest of the workforce? You could indeed access your files with a click of a button on your computer. Networked desktop PCs were becoming increasingly widespread in offices worldwide, and in August 1995, Microsoft launched its much-anticipated Windows 95. The World Wide Web started to take shape, and Yahoo (s yhoo) became one of the largest directories for web content. In short, advances in technology during the 1990s resulted in the “revolution in the office” that Pake predicted. Laptop computers were also becoming hot sellers, so the idea of a mobile workforce, while still a long way off, was starting to develop. However, Pake’s vision of a world without “hard copy” remains a fantasy. In spite of the increasing popularity of email and the web, the rise of devices such as the iPad (s aapl) and enterprise content management tools, such as Huddle and SharePoint (s msft), the paperless office is still out of reach. The desktop printers that became a familiar sight in the office in the ’90s continue to be the worker’s trusty companion. According to the WWF, the average U.S. office worker goes through 10,000 sheets of copy paper per year. People still want to have physical documentation. Whether it’s business records, receipts or utility bills, people continue to feel they need to store paperwork in a safe, physical place for future reference. To drive widespread adoption of new technologies, a cultural shift and change in habits needs to take place. Just as the introduction of word processing and automation to the 1990s office changed the traditional secretary-executive relationship (or “office wife” bond), enterprise content management and collaboration technologies are disrupting the way people work today. Transforming working practices takes time. The touchscreen “Knowledge Navigator” tablet device shown in the video could easily pass for an early prototype of Apple’s iPad, while the University Research Network accessed for information on deforestation in the Amazon rainforest looks suspiciously like the web. 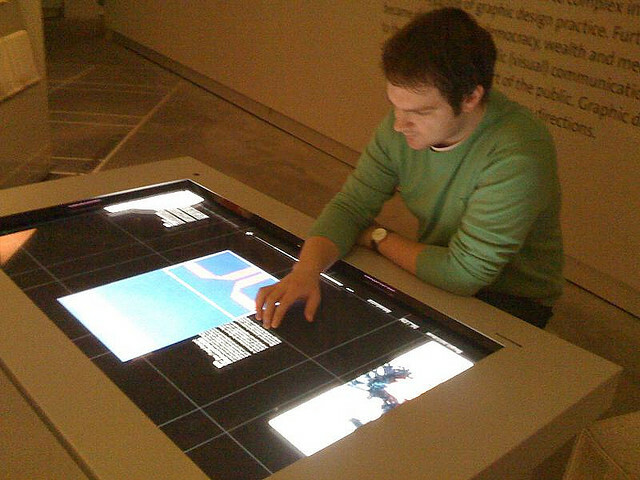 We are now accustomed to seeing touchscreen devices — according to market research firm iSuppli, worldwide production of touchscreen modules for use in computers is set to hit 117.9 million units in 2014 — but in 1987, mainstream adoption of such devices was still years away. Another application shown is video conferencing: The professor is seen happily conversing with his colleague on-screen. Now, of course, video conferencing is part of most workers’ everyday lives, whether they are based at home or in an office: another hit for Apple’s vision of the future. While I doubt avatars with bow ties fielding calls and managing diaries will take off (unless Clippy 2.0 is overdue? ), but virtual customer service assistants are now a familiar sight: Jenn at Alaska Airlines (s alk) and Lucy at O2 (s oiim), for example. It may be a while before speech recognition is as seamless as that shown in the video; it is still a familiar (albeit often frustrating) technology. The paperless office and a diary-managing avatar may not be a reality just yet, but many of the predictions made decades ago aren’t too far off the mark. However, there were some visions of the office of the future that just didn’t come to fruition, such as the short-lived Microsoft at Work (MAW). On June 9, 1993, Bill Gates launched MAW, which was supposed to connect common business machinery, like fax machines and photocopiers, with a communications protocol allowing control and status information to be shared with computers running Windows. It never got off the ground, and by 1995, it had disappeared from view. Andy McLoughlin, co-founder and EVP Strategy at Huddle, can be reached on Twitter @Bandrew. This is a great article and ultimately I feel people as a whole are slow to adopt change. For example there are still almost as many computers using Windows XP as there is for those using Windows 7 (and XP came out 10 years ago). I think most would be surprised how many companies still rely on “dated” technologies like fax machines. We’ve been using a fax to email service for quite some time now and it has definitely helped reduce our carbon footprint and save money. No more paper, toner, paper jams, etc. faxes come directly to my email account and can be sent from email as well. To me, the combination of FaceTime videoconferencing & desktop virtualization on an iPad (like Citrix Receiver access to a virtual desktop) is the best example of a could have been envisioned as part of the “office of the future”… and of all of the devices already here, it is the one most likely to bring us closer to the paperless office. I’d argue we’re already somewhat more advanced than some of the visionaries could even have predicted. I don’t like dealing with paper that much anymore. My printer is broke and I haven’t needed it in a long while. One of the main reasons paper is still so commonly used is that it is the easiest and still most reliable means to leave information with people we physically come into contact with. Sale ads at the front of a store, printouts for an audience of a presentation, receipts from a cashier, business cards for introductions, etc. Only when smartphones are in the hands of even the lowest of wage earners can we expect paper to shrink away. But these smart devices need to be high performance machines that are fully functional and able to seemlessly connect with any other device they may randomly encounter – which is certainly not the case today. Flexible LCDs with 3D touch screen displays will probably be essential. Biometrics will probably need to be built in for security, but we may not achieve total adaptation until venders and service providers cut the ambilical cords to the content they facilitate. I would rather keep my essential records and expensive reference books in print as long as there is a risk that some provider like Amazon or Time Warner could revoke my data for allegedly violating one of there Ts & Cs. And what if I should find myself short on cash for a stretch of time? – I would definitely need access to all of my data, not locked up in a cloud on a credit hold. Good points, Marc. I think it will be difficult to get to a totally paperless office. Paper is universal, after all. It does seem to me, though, that we over-use paper just because we’re so used to it. 10,000 sheets of paper per year per worker? Most of it probably end up unread, in the recycling bin. Enjoyed this article immensely. As always, top notch.